To wrap up our horror-movie extravaganza, this week, we watched three versions of Dracula. Now, this might sound super boring, but watching three movies back-to-back (two on one day, and the third on the next day) was a great way to see how the Vampire Lore we know and love got started, and how the lore has changed and evolved over the years. We start where all vampire aficionados ought to start. 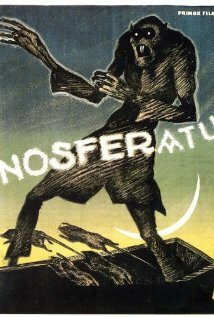 With Nosferatu. This was a 1922 silent movie adaptation of the story Dracula. This piece follows along relatively closely with the original story line, and it was a blast. A few things were a bit confusing at first, but by the end, you're able to figure everything out. This story follows Count Orlock (must've had some copyright issues with using Dracula) and his travels to England, his consequent obsession with his Solicitor, Harker's, wife, and the spread of disease and deaths throughout the town. It is only when Mina gives of herself freely that the deaths end and the vampire is defeated. From there, we time jumped almost a decade to the Bella Lugosi version Dracula that released in 1931. This version is a bit different in that Harker is not the one who goes to Transylvania to meet the Count, but rather is Renfeild who goes as the solicitor first and becomes one of Dracula's thrawls, which wasn't really ever explained in the Nosferatu plot. Harker later follows in Renfield's footsteps. Dracula again sets his sights on Mina, Harker's wife, and in this version, Dr. Van Helsing plays a much larger role, in that he tries to help protect Mina and the rest from the evils of Dracula. The final version we watched (though there are more) was the 1992 Keanu Reeves and Winona Rider version. 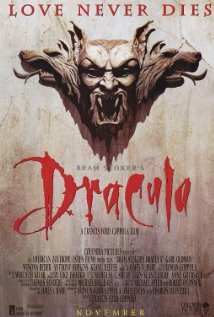 This was my favorite of the three because it not only closely followed the format of the book which is written as a series of journals and letters from Harker and his betrothed, but because it starts Dracula's backstory hundreds of years ago when he was originally Prince Vlad, and how he became Dracula. The love story between Vlad and his reincarnated wife (Harker's betrothed) and the parallel story of Mina and Harker gives so much more depth to the romance and human aspects of this horror story. It gives a fuller picture and really makes you feel for ole Drac, even if he's evil. It all ends up okay in the end. Drac becomes Vlad again, and lets his love for Mina keep him from killing her, and he is set free from his cursed existence. Well, now that it's finally Halloween, my horror-movie reviews will sadly come to an end now. I hope you enjoyed seeing horror through a romance author's eyes. Stay tuned for more fun goodies to come.